Integrity Erosion Control & Landscaping is a Hot Springs, Arkansas based business providing corrective outdoor solutions and landscaping services for Hot Springs, Little Rock, Fayetteville, El Dorado, Conway, West Memphis, and all surrounding communities. 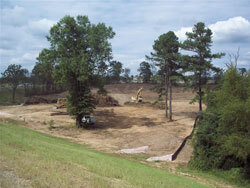 We are an experienced erosion control and drainage contractor. Our extensive experience and resources allow us to fulfill and execute all EPA, ADEQ, County, and City Regulations. We prepare site specific stormwater pollution prevention plans; design, install, and maintain BMP’s; Construction Stormwater Inspections, Temporary and Permanent Site Stabilization. Call 501-547-0022 or click for quality Erosion Control & Landscaping Services.